I’ve always enjoyed running and in the past few years (since graduate school). I’ve have had the time and energy to train and enter in a number of races. I don’t win. I don’t even really try, but I get out of running what I want for the amount of time I can put into it. I love being outside and getting to just have plenty of time to think. I do listen to the iPod on longer runs, to help pass the time. However, just getting to people watch and sight see is always fun. I’m always looking for interesting routes to take around my house and the office. I enjoy entering races, not because I expect to win or even really compete, but because they give me a goal. If I know I have a race coming up, I’ll be sure and keep my running schedule up so I don’t crap out in the middle of the race. Of course, I now have a hefty collection t-shirts lying around the house. Once and Done 5k 29:09 (2007 Running across the newest bridge on the PA turnpike; a one-time event before the bridge was opened to traffic). 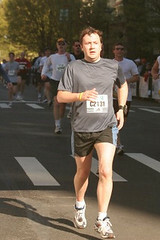 2006 Ukrop’s Monument Ave 10k 54:28 (3/1 – Proof of where no training gets me). 2006 Sweetheart 8k 41:20 (2/11 – Cold, wet and hilly and I nearly threw up). 2006 Frostbite 15k 1:21:33 (1/22 – So glad to have finally run this race). 2005 Turkey Trot 10k 56:28 (11/24 – Best Thanksgiving morning ever). 2005 Suntrust Richmond Marathon 4:36:30 (11/12 – My first ever marathon, time based on chip). My splits were: 1/2— 2:13:47, 20 mile— 3:28:31, total clock time— 4:36:30. 2005 Battlefield Half-Marathon 1:52:39 (9/4 – My first half-marathon ever). 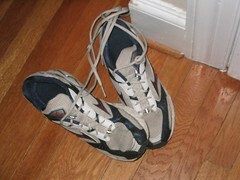 Mizuno Wave Inpsire – These shoes are the first ones I’ve owned in which my feet don’t hurt, no matter how far I go. Insport Running Gear – Great clothes that don’t break the bank. Clif Bars – Makers of tasty energy bars (that don’t taste like sawdust and motor oil) as well as Clif Shots. Give ’em a try. RunRichmond – Sean "The Running Gnome" Cusack’s great running site for Richmonders.